4Videosoft iPhone Transfer Platinum is able to transfer your music, movie, e-books, ringtones, and photos and more items between computer and iPhone. In addition, you can also back up iPhone SMS and Contacts to your PC for safety. Now it highly supports iOS 7 and the latest iPhone 5S, iPhone 5C, iPhone 5, iPad air, iPod touch, etc. This popular program enables you to export your files like music, movies, photos, e-books, SMS, Contacts, etc. from your iPhone to your computer. And you are able to transfer your local files to your iOS devices. It allows you to export your files to iTunes as you like. And you can also transfer files between two different devices. It highly supports iPhone 5S/5C, iPhone 5, iPad Air, iPad mini 2, iPod touch, iPod Nano, etc. 4Videosoft iPhone Transfer Platinum enables you to convert DVD movies and videos to iPhone MP4/MOV/M4V. These output videos are able to play on your portable devices like iPhone, iPad, and iPod and so on. You can convert your movies to iTunes library with high speed and quality. In addition, the powerful iPhone Transfer Platinum provides you with versatile editing functions like effect, trim, watermark and crop to optimize your output videos. The iPhone Transfer Platinum is able to make iPhone ringtone easily. You are able to make iPhone Ringtone for your iPhone with local songs or you can make them with DVD movies and general videos. It allows you to select the start time/end time and fade in/out for your iPhone Ringtone. The iPhone Transfer Platinum enables you to edit ID3 information of your iPhone such as edit name, artist, album, lyrics, etc. 4Easysoft Free Flash Video Converter is a specially designed Flash Video Converter, which can convert lots of video formats to SWF/FLV. Supported input formats include AVI, WMV, MP4, 3GP and MP3, AAC, WMA, WAV, OGG, etc. This software is designed specifically as the family entertainment center. It is used commercially in Karaoke bars and nightclubs. 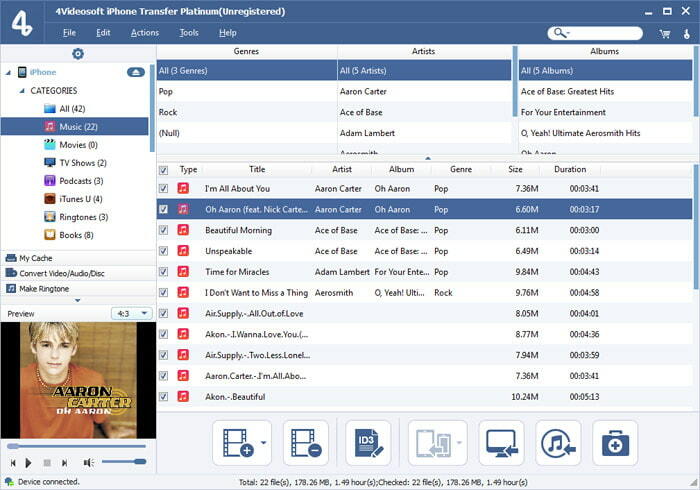 It is used to manage karaoke play lists and HD/DVD/VCD movie contents.The Best Music Organizer & Player.